This unique water-based salt solution deep cleans ceramic tiles and creates perfect bond for our SKID SAFE Water Based Sealer/Finish. SKID SAFE Water Based Sealer/Finish provides Extremely High Slip Resistance to make your ceramic tiles much less slippery whether they are dry or wet. SKID SAFE also provides exceptional durability, resistance to staining, and ease of maintenance because it does not need to be stripped. It is Warranted for 5 years! For maximum protection that our products can offer against slip and falls use SKID SAFE with ND AGGREGATE™. These two products create NON-SLIP TRUE TRACTION FLOOR COATING. SUPER BOND AND CLEAN™ has no VOC’s, no acids, it is non flammable, and has only slight dull odor. WHERE TO USE: Ceramic tiles, porcelain tiles, brick, and limestone. ATTENTION: Your successful installation of our products and years of extraordinary benefits they offer is possible only if you read and follow our directions/precautions exactly as they are written. They are result of years of research, development and testing, so please take your time to familiarize yourself with them. If you have any questions please do not hesitate to contact us. 1- Test this product on a spare tile sample, or in a small inconspicuous area for suitability before treating the whole floor/wall. Read all Precautions and Directions thoroughly before using this product. Precautions: Adjacent areas must be properly protected when using this product. Though harmless to most building surfaces, the damage SUPER BOND & CLEAN™ causes to glass, soft metal is considered permanent. Cover all nearby windows and aluminum with plastic sheeting and plastic tape. Also, protect vegetation. SUPER BOND & CLEAN™ turns foliage brown on contact, and if drawn up through plants roots, it dehydrates and can kill them. Cover plants with plastic sheeting to keep concentrated SUPER BOND & CLEAN™ off foliage, and protect roots by either containing the rinse or trenching it away. Wear rubber gloves and safety goggles. If working indoors ventilate the area. 2- Strip old seals/finishes with a stripper to clear all pores of the grout lines and to clean and to strip tiles. Rinse the residue and neutralize the surface with a water-vinegar rinse of 4-1, or use a neutralizer. Let the floor dry. 3- Use a clean pre-rinsed and dried mop, or a quality sponge mop to apply SUPER BOND & CLEAN™ at full strength at about 400 sq. ft. per gallon (100 sq. ft. per quart). Do not mix it with water. Make sure that the floor/wall are all well covered with this product. Allow SUPER BOND & CLEAN™ to soak on the floor/wall for 3 minutes. DO NOT ALLOW OUR PRODUCT TO REMAIN ON THE FLOOR FOR LONGER THAN 3 MINUTES. Closely monitor the work area making sure that it is at all times thoroughly covered with the product, and treat only as big area as you can handle. 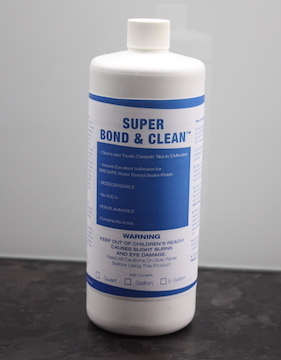 SUPER BOND & CLEAN™ must not dry out on tiles, or any surfaces. Dried whitish residues cannot be removed by normal cleaning! Removal requires our FROSTING REMOVER™. DO SMALL AREAS TO INSURE EASIER REMOVAL AT 3 MINUTES. 4- Clean the floor thoroughly with mop and clean water three times to remove all loose residues of SUPER BOND & CLEAN™ with a wet vac. It is essential that all residues of SUPER BOND & CLEAN™ are thoroughly removed from the floor surface. 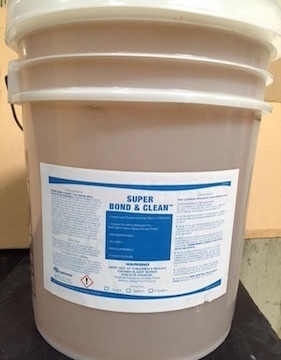 Failure to thoroughly clean all of the SUPER BOND & CLEAN™ residue is likely to create a problem when SKID SAFE is applied. After the cleaning let the floor dry. If there is any visible loose dried film of residue of SUPER BOND & CLEAN™ on it, mop and wet vac the floor again. The tiles should look dull because there is now a frosting on them to create excellent adhesion for our SKID SAFE Water Based Sealer/Finish. 5- Seal the tile floor/wall with 4 coats of SKID SAFE Water Based Sealer/Finish applied one coat at a time after each coat is absolutely dry-to-the-touch. PRECAUTIONS: Wear rubber gloves and safety goggles, when handling SUPER BOND & CLEAN™. Ventilate enclosed areas. If SUPER BOND & CLEAN™ gets on skin or into eyes, rinse immediately with water. See Material Safety Data Sheet for more detailed hazard evaluation and safety information. 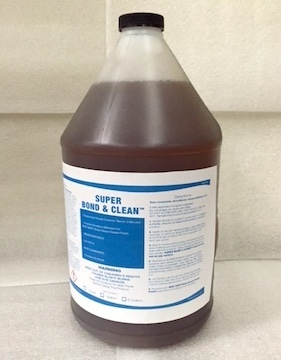 Environmentally Safe: SUPER BOND & CLEAN™ is readily biodegradable and releases no V.O.C.s. When used properly, it poses no threat to the environment. Dispose of all wastes safely according to federal, state and local regulations. FIRST AID: Rinse eyes thoroughly for 15 minutes and seek medical attention. Rinse skin thoroughly with running water. If ingested drink large amounts of water or milk, DO NOT INDUCE VOMITING, and seek medical attention. CAUTION: CONTAINS FLURIDE SALTS THAT MAY BE HARMFUL OR FATAL IF SWALLOWED. KEEP OUT OF REACH OF CHILDREN, FROM GLASS, AND METAL TRIM.